It was 101 years ago, on March 25, 1911, that one of the most catastrophic events in the history of American industry occurred, the consequences of which are still highly relevant today. At the turn of the century, New York City's garment and textile industry employed vast numbers of workers -- mostly immigrants and mostly women. They worked long hours for low wages and had limited choices. The Triangle Waist Company factory employed hundreds of women who sewed "shirtwaists" (blouses) on the eighth, ninth and tenth floors of a Greenwich Village building near New York University. The now infamous fire started toward the end of a Saturday afternoon workday when a bin of cloth scraps caught fire. The alarm was raised and the fire may not have been notable had not several conditions been present: the factory's managers had locked one exit in order to prevent the workers from stealing and the manager with the key to the exit escaped, leaving many workers with no means of egress. Also, months of cloth scraps had accumulated making the factory into a tinderbox. There was no audible alarm system or intercom to warn the other floors of the factory of the inferno. As flames engulfed the remaining exits, panicked women crowded onto the fire escape, which, unable to hold their collective weight twisted and pulled away from the building. Knowing the were trapped many women chose to leap from the upper stories, plunging to their deaths and creating a horrific panorama.In less than 20 minutes, 146 people had died. But beyond the sensational nature of this horrific event, why does it still matter? The answer can be found in the aftermath of the fire. 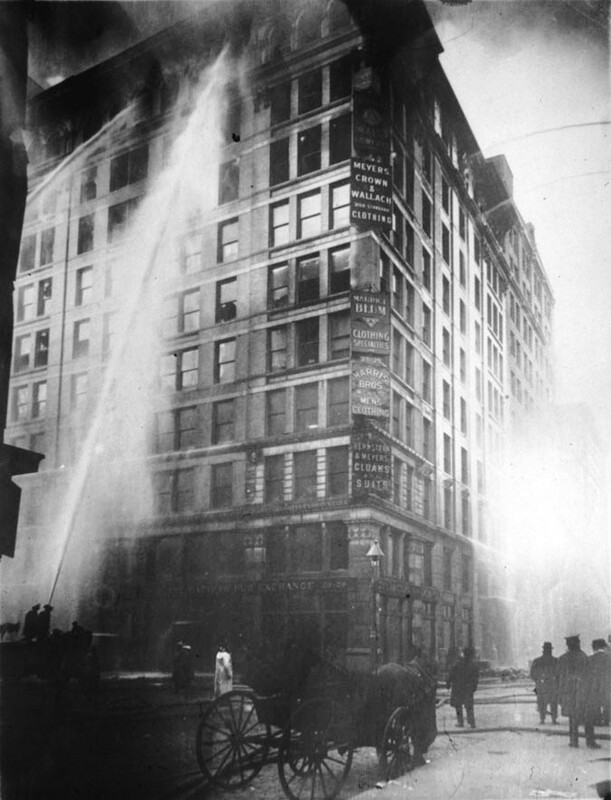 The Triangle Shirtwaist Fire prompted reforms to labor laws and building codes and mandated fire exits, fire extinguishers, alarm systems and sprinklers, improved working conditions, and shorter working hours. If I may get a little bit political, I think it's important to remember where we started, before such government regulation. There is a vocal outcry in 2012 against government interference in business, against environmental standards, health insurance mandates and other so-called "big government" measures. But you don't have to look very far into the past to understand what happens when such regulation is absent. For more information about the Triangle Shirtwaist Fire including a plethora of photographs, audio from survivors and other primary sources check out this excellent website, Remembering the Triangle Factory Fire, put together by Cornell University's Labor-Management Documentation and Archives for the 100th anniversary. A very important, tragic incident. Thank you for remembering and for honoring the day and the women who lost their lives. A few weeks ago, while shopping at The Manhattan Vintage Book & Ephemera Fair (a.k.a. the Shadow Show), I came across a relatively new antiquarian bookseller -- Honey & Wax Booksellers -- and was blown away by their carefully curated booth and beautiful catalogue (which has already gotten some buzz, excuse the pun). Heather O'Donnell founded Honey & Wax Booksellers in 2011, after learning the business at the venerable Bauman Rare Books. Wanting to focus solely on literature, she started Honey & Wax in her Brooklyn dining room and has since carved out a unique niche for herself in the book world. As her website states, "Honey & Wax Booksellers offers great works of literature: rare first printings, beautiful and curious editions, copies with surprising stories of their own. We handle unique books, striking books, books with no downloadable equivalent." I recently quit coffee. And I love coffee. But I quit the bean to ease my migraines (working so far). Around the same time I tore through Stieg Larsson's Millennium trilogy and was struck with the sheer volume of coffee the girl with the dragon tattoo, Mikael Blomkvist and friends drank while seeking revenge and doing investigative journalism. It made me wonder... Do those long Scandinavian nights require insane amounts of coffee? Were all the coffee breaks taken by Lisbeth Salander a mere literary crutch? The answer to these questions can be found in the 18th century when Frederick I, the king of Sweden from 1720 to 1751, banned coffee in his kingdom. Coffee had first arrived in Sweden in the late 17th century, and by 1746 Fred decided he needed to tax the import. He taxed coffee paraphernalia and tea as well. With the much anticipated season 3 of Downton Abbey, we see the reemergence of a theme from season 1 -- the precarious existence of English manor houses like Downton Abbey in postwar England, a very complex and interesting chapter in British history. Although the strain of maintaining these grand country houses was already beginning to show prior to World War I, after the war, the ruin of such homes accelerated. The tremendous cost of the war, led to the United Kingdom dramatically raising taxes. I am a researcher and writer for a rare manuscript dealer in New York City. I used to be a journalist. My love of history and my need to share the stories I discover in my work prompted me to start this blog.